Deforestation is the cutting down or removal of trees from forested or wooded areas without compensating the loss with the replanting of new trees. The estimates are that large areas of land, approximately, the size of Panama are deforested on an annual basis. It is conceivable that much of the world’s forests could vanish in the next century due to the effects of deforestation (NASA, 2009). While there are many who argue about the true cause of deforestation, in all actuality there are multiple single variables (Geist and Lambin, 2002). In developing countries, much of the deforestation occurs out of a basic and economic need to provide for one’s self and family. Consumption is the obvious cause, with a growing population that requires increasing amounts of timber used in manufacturing furniture, construction and a variety of other uses. In Nigeria alone, over 90% of tropical lowland rainforests in the Cross River State have been lost to deforestation (Lawrence, 1999). An overwhelming majority of the population needs wood for cooking and heating due to limited energy sources and costs. Farmers and others who live in small cities or rural communities, will often cut down trees not only for fuel but to make more room for agriculture or grazing livestock. Uncontrolled logging to satisfy this need is common throughout the continent. While this practice is widespread among African farmers a majority of the annual deforestation is directly attributed to commercial logging. According to (Porter and Brown, 1999) an estimated 25 percent of Africa’s deforestation is directly related to commercial logging. Multinational logging companies often will buy or rent large hectares of land from developing nations. Often there are few regulations regarding industrial or best management practices and little if any concern to environmental consequences. Economic and political interests are also in play as the logging industries in Africa’s forest communities generate jobs and millions of dollars in domestic or regional trade and in indigenous livelihoods (Morgan and Sanz, 2007). In trying to balance the needs vs. the costs, one immediately realizes that aside from a short-term economic benefit, there are only negative long-term consequences to the environment, and by extension to subsequent generations of Africans. Nutrient poor deforested areas contribute to the phenomenon on “Desertification” Historically, one can look to the effects of the 1930’s Dust Bowl in the United States, where the effects of a long term drought and the displacement of tons of topsoil that were blown off barren fields and carried in dust clouds for hundreds of miles. This event displaced millions of people who were forced to abandon their farms due inability to grow crops due to the extreme degradation of the soil. Another important role of the forest is that it absorbs a great amount of water during the rainy season. Once removed, soil percolation or the ability to absorb large quantities of water, is negatively effected. When this occurs, flooding displaces large quantities of soil and results in landslides. One only has to look to recent history for examples of this. 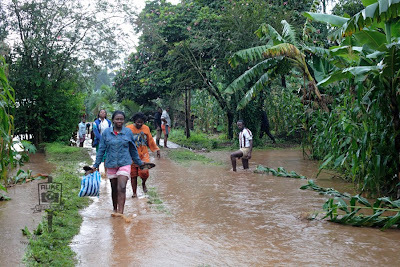 From 1997-2010, mudslides after extreme rainfall events near a densely populated mountainous area of Mount Elgon, Uganda, resulted in numerous fatalities and the displacement of over 11 millions m3 of slope material (Mafabi, 2010). In July of 2003, a three-day rain event near the Bambouto Caldera in Cameroon resulted in a swarm of over 100 landslides that killed 23 people (Bongsiyisi, 2009). In areas adjacent to rivers, lakes and streams, deforestation can result in water with increased sediment deposits, increased turbidity and elevated pH levels. The consequences of these negative factors often result in fish kills and the degradation of the watershed, including all forms of life that rely on the careful balance maintained by nature. The obvious or most practical response would be the development of an effective Silviculture Management Plan (controlling the growth, composition of forests) that all African countries would develop together to minimize or mitigate the negative impact of deforestation to the continent. The main part of Silviculture Management or Sustainability Management Programs are the careful balance between the planting and removal of trees. For example, in the simplest terms, if a tree were to be removed, one or more trees would be planted in its place. That way, the balance in the forest could be maintained, and there would always be one or more trees to take the place of every tree that is removed. However, before an adequate solution is found, it is important that the problem is identified. In this case, the deforestation or the denuding of the African forest is but a symptom of a larger issue. That issue is the lack of needed resources available to the population and the intrinsic desire to acquire more. The need for affordable fuel should be the main concern. Until an adequate replacement source is found, someone will always be searching for a tree to cut down. As populations continue to increase, the need and competition for the resource will only increase. Finally, as long as governments in developing countries are willing take money and turn a blind eye to foreign corporations who exploit resources, it will be impossible to find a workable solution. Geist, H., & Lambin, E. (2002). Proximate Causes and Underlying Driving Forces of Tropical Deforestation. Bioscience, 52(2). Lawrence, W. (1999). Reflections on the tropical deforestation crisis. Biological Conservation, 91(3). Mafabi, D. (2010). Wildlife body warns people about staying around Mt Elgon. Sunday Monitor. Morgan, D, and C Sanz (2007). "Best Practice Guidelines for Reducing the Impact of Commercial Logging in Western Equitorial Africa." IUCN: World Conservation Union. , Switzerland: International World Conservation Union, 2007. Print. Read 56491 times	| Like this? Tweet it to your followers! Typically an extraordinary customer has to sacrifice her love for a brand as a result of it's too expesive. However every e-retail store gives temptingly generous low cost on all branded sandals in UAE. You can take your time to match the merchandise and make a better choice while buying. Some online stores even ship your product free of value at your doorstep. The primary point we should deal with is the fabric of the flip-flop. The key fitflop sale issue of the selection for flip-flops is on the laces which are between the soles and the toes. The sole of the Fitflop Sandals shouldn't be the fabric which is the only real sponge. This will solely exacerbate the hazards talked about above. Choose the flip-flops with good sole will reduce the damaging of the sandals. For the choice of laces, I feel you don't want to let the soft pores and skin of the inside of the toe to be hurt. So, we had better select the smooth elastic material.